This work is hand carved from a single piece of Butternut wood and mounted on a Walnut base with a brass plaque identifying the subject. Known as the greatest Civil War cavalry commander on either side General Forrest was consistently victorious over superior forces. Although he had no military education whatsoever, his tactics were innovative and sound. He became active in politics following the war and was the first Grand Wizard of the Klu Klux Klan. Although the Klan was initially formed to protect Southern whites from bands of marauding ex-slaves, Forrest resigned when the Klan began using violent intimidation tactics against peaceful blacks. The piece is currently on display at Codori's on the Square, Gettysburg PA. 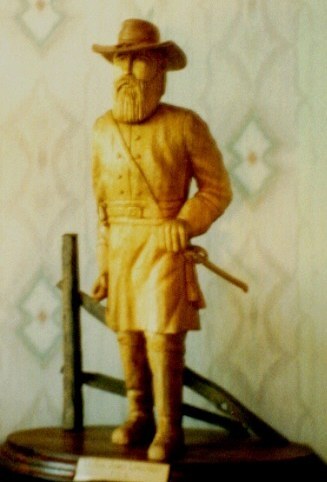 This woodcarving depicts Lee's "Warhorse," General James Longstreet CSA, as he stands watching the preparations for Pickett's Charge. 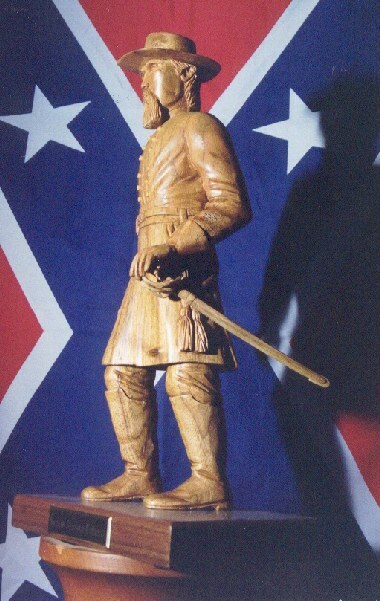 The figure is in Butternut wood and mounted in front of a Cedar fence on a Walnut base. The carving is in a private collection in Ohio. As Charleston, South Carolina was tightly blockaded by the Yankee fleet, Captain Horace Lawson Hunley came up with the idea of building a boat that could travel under water in order to blow up the blockaders. He designed and built the world's first submarine out of boiler plate. Hunley was drowned along with his crew in an accident during the final testing of the craft. The submarine, christened The Hunley, was retrieved, refitted and manned by a new nine man crew. This crew eventually blew up the Yankee warship Housatonic using an explosive charge attached to a long spar. The Hunley's crew signalled the shore batteries, using signal lamps, that they had survived the explosion but the vessel and crew were never seen or heard from again. The Hunley became the first submarine to sink an enemy warship. The Hunley was recently discovered on the bottom just outside Charleston harbor and has been raised. The submarine is currently undergoing restoration in Charleston. 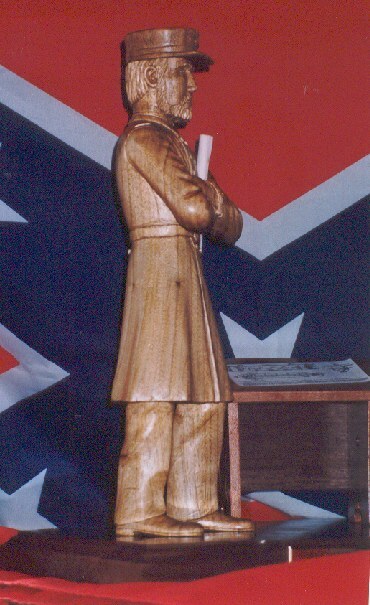 The carving depicts Captain Hunley, in butternut, standing beside a Maple table with a miniature blueprint of the submarine. Other blueprints are rolled up and held in the crook of his arm. The figure stands on a Walnut base with a brass name plate. This piece is on display at the Southwood Sculpture Studio.